Reading and sending emails in a language you don't know is now within your power. Our email translation software allows you to communicate in multiple languages directly from your Outlook, Outlook Express, or Windows Mail programs. Whether you email friends, family, co-workers or clients, the E-Mail Translator gives you multilingual mailing abilities. Let's say you need an English to Spanish translator so you can write to a colleague or friend in Mexico. You'll also need a Spanish to English translator so you can understand his return email. 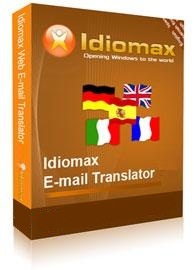 With the IdiomaX email translation software, you can translate to and from five languages with a click of your mouse. Simply open the email, click the email translator icon on your taskbar, and your translated message will appear on the screen (the original message is saved, too). If the email uses technical, business, legal or medical terminology, you can select one of our specialized dictionaries (listed below) to apply to the translation. There is no easier, faster way to translate emails to and from English, Spanish, French, German and Italian. You can even translate in real time and have email conversations on the fly. Instant access to email translator via taskbar icon. Access to specialized dictionaries to apply to translation. Access to language dictionaries for quick look-up of words and phrases.